Looking to save $$ on 3 season wearables? 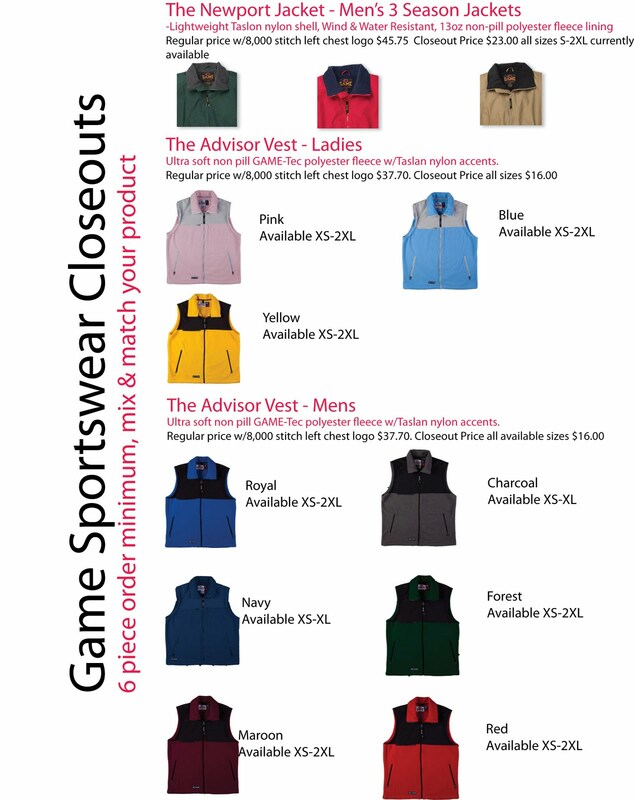 Check out these closeout Men's 3-Season Jackets and Fleece Vests (men's & woman's). Offer lasts until inventory is sold out. Low order minimums. Call, e-mail or stop by the store if you have any questions or would like us to check inventory for you. Great Product at Great Prices!!!!! Are you looking for Staff Polo’s for your employee’s, team or special event? From now until Aug 31 the Gildan G380 is on sale at unbelievable prices, Starting at just $12.00 w/left chest logo up to 8,000 stitches. Regular price with 8,000 stitch left chest logo is $15.55 S-XL. To view the variety of color selections please go to www.4logowearables.com and type G380 in the search box. Offer applies to in stock product only. For more details on pricing & product please see the flier. Questions? Please call, e-mail or visit us in person at the store. 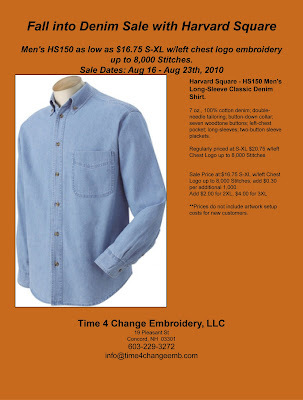 Great prices on Harvard Square HS150 denim shirts. Sale starts Monday Aug 16, 2010 and ends Aug 23, 2010. 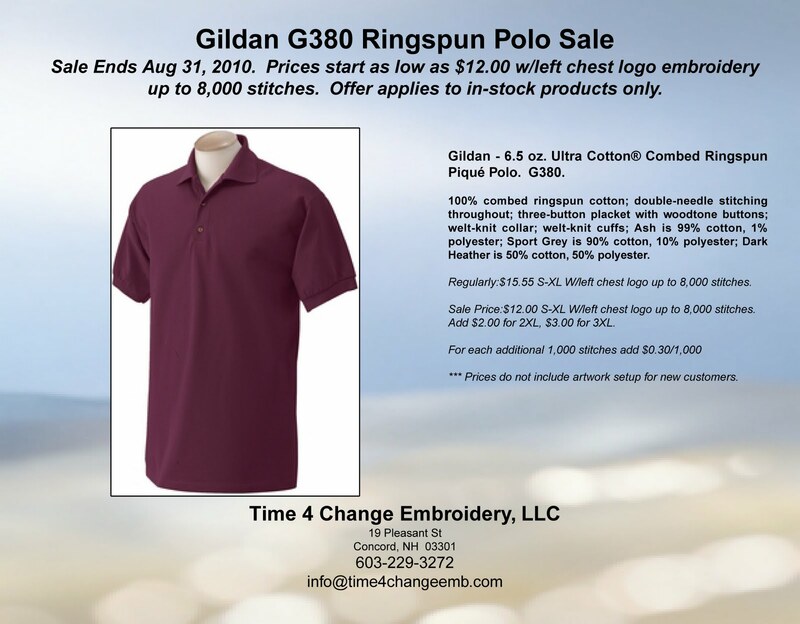 Prices as low as $16.75 w/left chest embroidery up to 8,000 stitches. Add $.30 per additional thousand. View flier for more details. Looking for ways to have great looking embroidered wearables for your business, organization or team, but your on a budget? Let us help!! Now is the time of year that many suppliers are having sales and deals on closeout products as they release their 2011 catalogs. 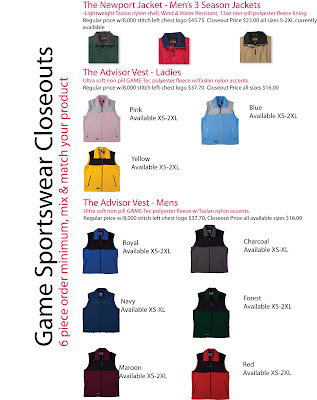 Great products from Game Sportswear, Holloway, Ash City & North End to mention a few. Call, e-mail( info@time4changeemb.com) or stop by the store and let us know what your looking for, we'll do the research, to see if we can help you save money with year end deals.